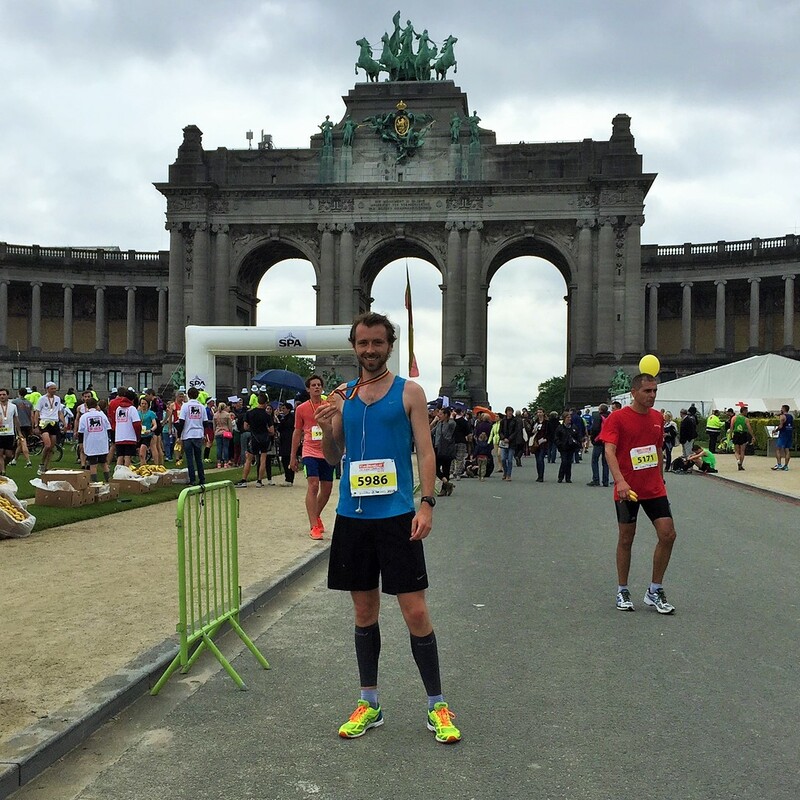 As a creature of habit, I spent the eve of this race unnecessarily getting up at the crack of dawn and walking (far too much) around Brussels. Although Pippa was back in the UK, Arno came up from France to make sure I kept up my pre-race mileage far above sensible limits. As I had worked in Brussels two years ago for a few months, it felt like I was coming back to familiar sights. 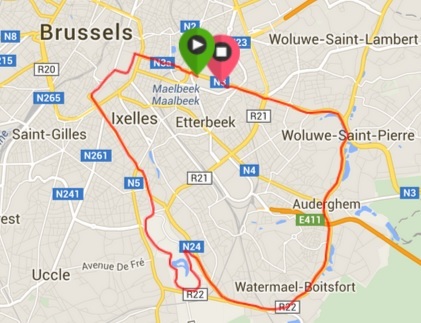 However, I unquestionably did NOT recall just how hilly central Brussels was! As I picked up my race number (and a very strange goodie bag which had muesli, chocolate spread and jam in it), a shop assistant told me that the race – although not quite a trail race, was “lourd” which doesn’t really make much sense in either English or French (but I’ll assume it does in Belgian). Anyway, I got the gist of it and quickly decided that there’d be little chance of a good time or PB and I’d be better off focussing on a top 1-2% finish. 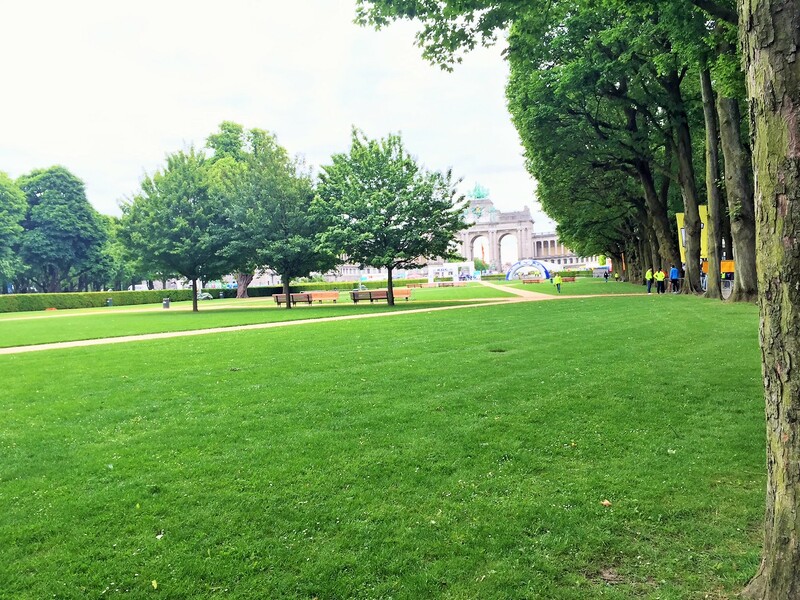 Race day came along and I found myself in a ghostly empty Parc du Cinquantenaire. 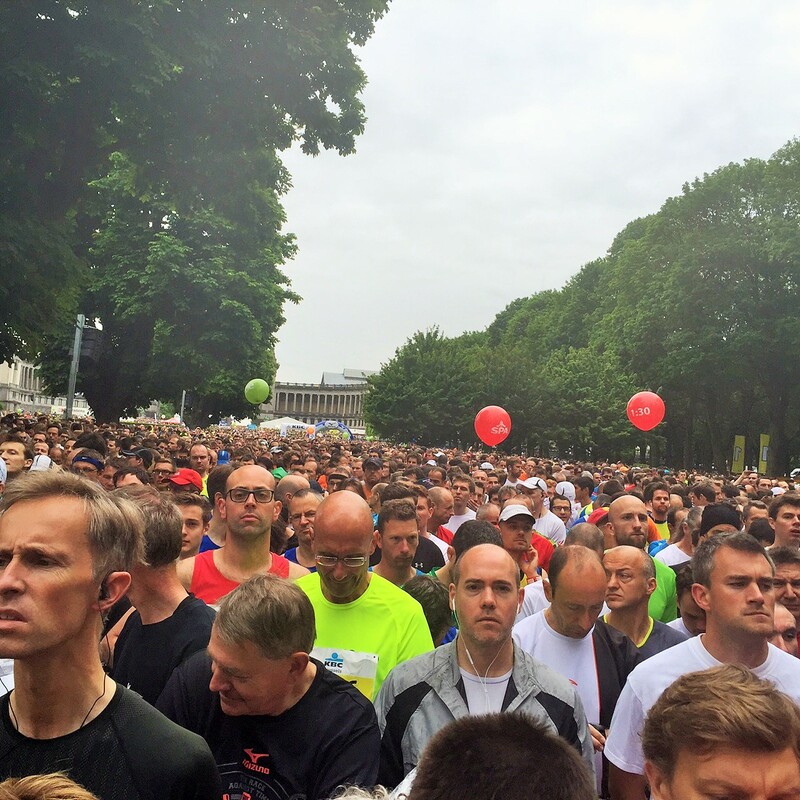 The race organisers claimed there were 40,000 participants but, at that point, even 40 might have been a stretch. Surely enough however, the park soon filled up and I found myself near the front line, guarding my spot and clenching my bladder, patiently wondering why the hell I’d turned up so early to stand in the drizzle and wind. 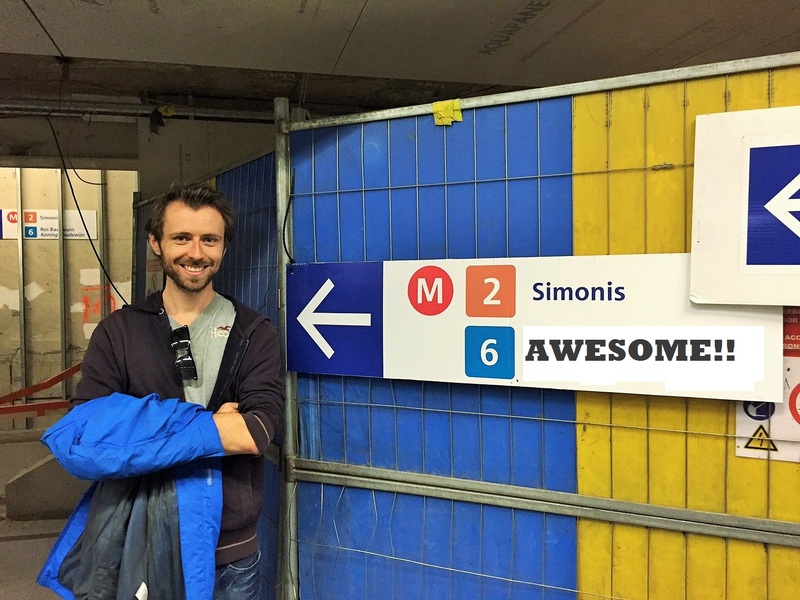 Fittingly for the European capital, the runners were a cosmopolitan bunch and stereotypes were rife: British runners jumping queues; Italians apologising for bumping into you; French queuing in an orderly manner at the toilets … or something like that. Eventually, after the sixth or seventh rendition of Carmen and Vangelis in a row, we were called forward and we set off in almost perfect weather: 12C, cloudy, drizzly and breezy. The first kilometre was promising and I gathered pace as I sped downhill past the European Parliament on the tarmac. Shortly after that, conditions changed and I started making a mental note of all the excuses creeping out of the woodworks which I’d be able to use: the rain; the wind which was now in your face; cobbles; hills; hills; slopes; hills; slopes … even in what seemed like the flat bit of town, they made us go through tons of tunnels with pretty steep inclines in/out of them. Oh well, cry me a river etc… On a marginally more serious note, I was rapidly developing a genuine, valid, excuse as an old tear in the hip/glute was flaring up from the very start. The other things which were a pain in the bum were some of the wheelchairs from the Handisport race which set off before us. In principle, it’s obviously fine for them to race alongside us but they really should all have appropriate braking mechanisms (especially in a hilly race!). Around the seventh kilometre, other runners and I had to jump out of the way as we heard someone shouting “OH OH OH” as his brakeless wheelchair was rattling down past/through us. As the cool kids would say… WTF! The race itself is fairly typical of inner city races: a few suburbs, some very nice parks (in particular the Bois de la Cambre), a fair few sights (various churches and the Justice Palace are the ones which stick out) but a relatively sparse crowd. Being fair, I suspect the weather might have something to do with that. Running uphill was physically painful. Running downhill mentally so. It brought back memories of Madrid as the awareness that “every meter down = 1 more meter to climb back up” creeps back on you. I’d been warned before the race that the last few kilometres were tough as they were “faux plat”, which translates as false-flat (i.e. it looks flat but it’s a gradual climb). “Faux mountain-side” might have been more appropriate for the 17th kilometre. Gee! My pace dropped by over one minute/kilometre at that point! A mountain goat, I am not! The last couple of kilometres were thankfully flatter and I gathered a little bit of speed. This time, Arno didn’t sleep in and was there to snap a photo of me as I went by and overtook three people in the last corner (and there’s even a video! I’m 22 seconds in.). 2 were running but 1 was … bright green and lying on the ground being attended to by the emergency services. Oops. It’s odd that someone of that standard would collapse in the last few metres but hopefully he’ll be ok. There was nothing online to suggest he wasn’t, so I’ll have to assume he was fine. I crossed the line in 1:20.08. This was neither great nor terrible which I think is a fair description of the race overall: just a little “meh”. On the plus side, I’m becoming quite the expert at pacing myself with 5km splits of 19.20, 40.04, 1:00.03, 1:20.08: (although, a real expert would have been a few minutes faster per split! ).